December 17, 2018 November 25, 2018 / Elizabeth T.
It’s finally one of my favorite seasons of the year (who doesn’t love all of the red and orange falling leaves, toasted marshmallows, and rich hot chocolate). But as most of you also know, the last three months of the year are also the busiest for me, since I work in a corporate marketing industry at a company that specializes digital retail, which means the holiday season is nothing short of hectic and crazy! During this time of year, I’m usually juggling super long hours at work (10 – 12 hours shifts, 5 days a week), my nightly blogging ventures, and some semblance of a social life. Needless to say, I’m usually running from one place to another, and on the weekends, I’ve been leaning more towards an easy and causal street style look (especially since I’m in office-wear most of the week). Read on to see my easy formula to creating a street style look that’s both trendy yet cozy! Although it’s fall, LA isn’t necessarily too cold for crop tops just yet! To make these types of ensembles more weather-appropriate, I’ve been gravitating towards knit crop tops or cropped sweaters, since they still sport that street-style-chic vibe, while also being functional. For those of you that live in places with more extreme weather conditions, the key to wearing a crop top is being mindful of outerwear! While a jacket or coat will definitely keep you warm, nothing adds that perfect touch of edgy street style cool than a bomber jacket! 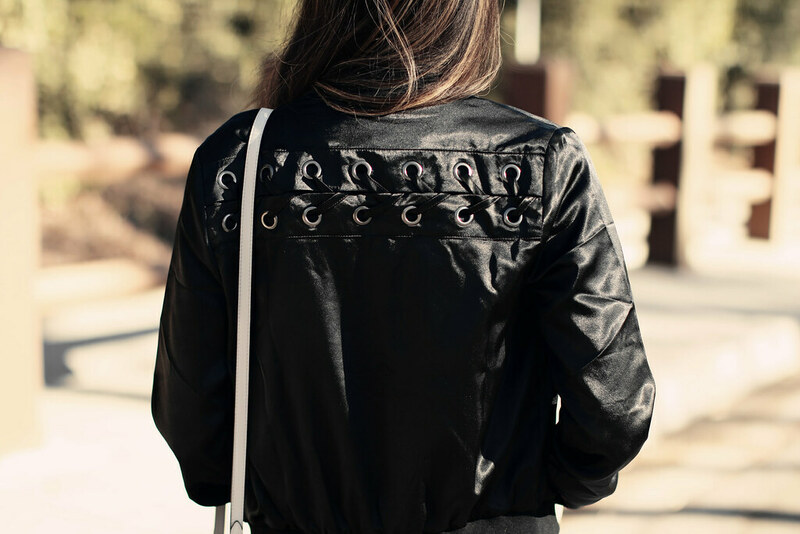 I’ve been loving this black one in particular because the lace-up details across the back gives it the perfect edgy look! As always, attention to detail is what sets a regular outfit apart from an elevated one, don’t you think? If bombers aren’t really your thing, or it’s already super chilly where you live, you can always opt for a denim or leather jacket as well, since these two autumn wardrobe staples add major points to a street style look! If there’s one thing that I’ve been loving about the denim trends this year, it’s definitely the distressed wash, although the boyfriend fit comes in a close second! Though I love my super skinny jeans and how they make me look like I actually have curves, I can’t deny that boyfriend jeans are just so cozy yet chic to wear! I love the looser fit, and the distressed detailing just adds the perfect rugged, street style touch to just about any outfit. And of course, no outfit is ever complete without shoes, and I haven’t been able to get enough of these super cute white kicks from Adidas! 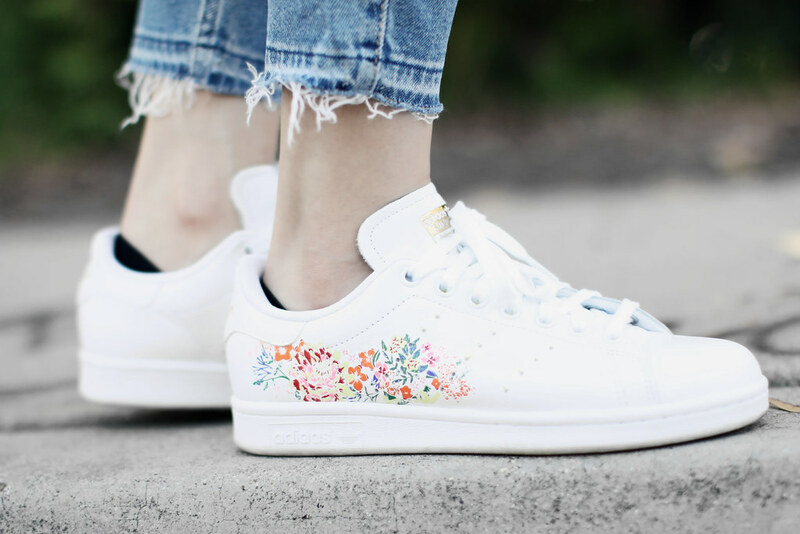 Not only are they super comfortable to wear, I love how the small flower details add just the right touch of femininity back to this street style look, making it subtly girlish without being too over-the-top! What’re some of your favorite off-duty looks? Let me know in the comments because I always love hearing from all of you! I hear you about the hectic schedule. And this is a great casual look and the sneakers are so fun. The sporty chic trend is nice because it so somfortable. Yes, I love cozy looks that are still chic! ❤ 🙂 The perfect mix of stylish and functional! Thank you! ❤ 🙂 You're too kind! Love this outfit! The jacket is my fave! i have a crop sweater but i haven’t been able to pair it yet! Oh, I love pairing it with skirts! ❤ Makes for such a chic look! Love this street look ! your sneakers are soooo cute!! I love this edgy and comfy look! I am all about jeans and a bomber jacket and kicks so this look is perfect for me! I would have never guessed that winter is your favorite holiday! Hehe I think mine is definitely spring or summer. I love how this outfit looks instantly more edgy and cool when styled with the black jacket. Hahaha I actually love fall and summer too, but winter will always have a special place in my heart because of Christmas ❤ 🙂 Thank you so much babe! You're always the sweetest! Super chic style, darling! I love the details on the jacket, makes it so much cooler. Yes, this jacket is super fun to wear too! Oh this is a great off duty look. Love the sneakers in particular. Can never have too many of those! Yes, sneakers are so cozy yet chic ❤ 🙂 Thanks love! loving those jeans! great look! Oh, love the details of the bomber jacket. My casual look is more skinny jeans and a sweater. I love the comfy feeling of a sweater. I love this edgy and lovely look. your sneakers are so cute. You look gorgeous babe!! Love a good crop top! Perfect for Sydney weather!! Yes, crop tops are always the best! Thanks babe!